Key word people “LEGALLY”! …….could have allowed him to legally skip paying federal income taxes for years. Who do you know that voluntarily pays or pays more than they need to or are required. NOBODY! In a statement, the Trump campaign said the real estate magnate has a “fiduciary responsibility” to his business, family and employees “to pay no more tax than legally required.” It added that Trump has paid hundreds of millions of dollars in other taxes, including property and real estate taxes. “The only news here is that the more than 20-year-old alleged tax document was illegally obtained, a further demonstration that The New York Times, like establishment media in general, is an extension of the Clinton campaign, the Democratic Party and their global special interests,” the statement said. UNBELIEVABLE MOMENT, YOU SHOULD HAVE BEEN THERE, HOLLIDAY CLOSES OUT SEPTEMBER OPENS OCTOBER WITH A BANG! Matt Holliday, has been a St. Louis Cardinal for 7 1/2 years. A great Cardinal, loved by Cardinal nation. Matt has been my favorite Cardinal since his arrival in St. Louis. I was there for his first game in a Redbird uniform, when he hit a double off the left center-field wall to excite the crowd. Matt has been on injured reserve for several weeks with a broken thumb. It’s healed but still a bit sore and stiff. The Cardinals announced they would not pick up the left fielder’s 2017 option. They agreed to activate him for the final regular season weekend, for a farewell to the fans. He did not disappoint and neither did the fans. I was with my daughter last night, with great seats down the third baseline in the 2nd level, a great view. My daughter is pregnant, was craving some water. It’s 7th inning stretch, and I was going to use the restroom (too much info, sorry) she ask if I’d get her a bottle of water; naturally I would. I was approaching the concession worker, with my eyes on the TV monitor above, could I be seeing this correctly? Holliday has bat in hand approaching the plate and his name is announced. The fans knowing we were possibly seeing his finale at bat, game as a Cardinal, gave him a strong Cardinal Nation standing ovation. I stood and watched as he takes his classic Holliday swing the other way and the ball sails into the right field bullpen, a solo home run. Incredible, unbelievable, he has swung a bat in weeks and he catches the ball perfectly and drills it; you could not write a better ending. Holliday is greeted by first baseman Matt Carpenter with a hug as he crosses the plate. At the top of the dugout steps, long-time teammates Yadier Molina and Adam Wainwright meet Matt with a three-man hug, tears begin to flow from Holliday and possibly his mates. Once in the dugout, the other team members share hugs, but the fans demand a curtain call. Matt came back to the top of the steps, tips his hat to the crowd, a delirious fan base. 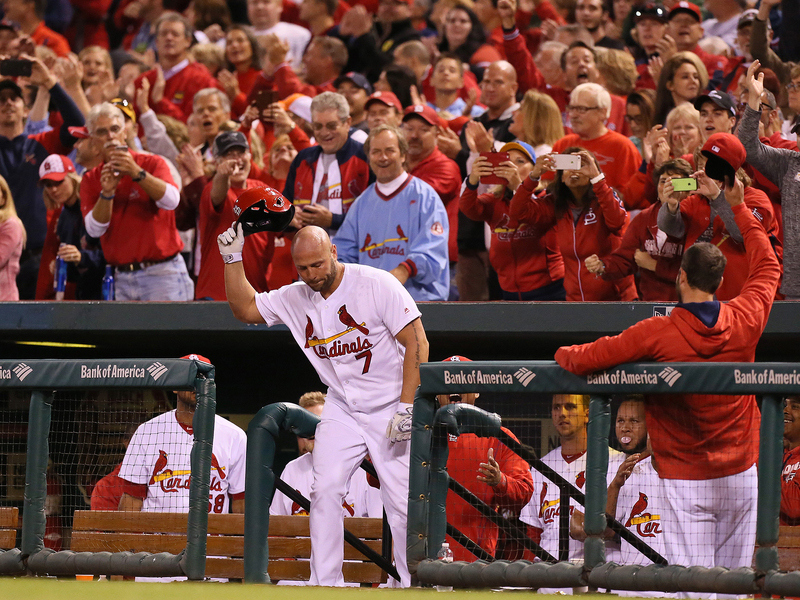 More tears flow from Holliday and some from fans as iPods and other video devices capture this beautiful moment. I will admit, I was choking back tears. When I made it back to my seat, my daughter laughs, and says thinking to herself, “Dad is missing Hollidays final at bat.” and seconds later “Oh dads going to be so upset he missed this Holliday homer.”. I didn’t miss it, I saw it on the T.V., “it’s not the same” she says. I told her, “but I was here”. What I did see, that I can never remember seeing quite like this before: When the ball fell into the bullpen, the crowd around the concessions were screaming, including the workers, my concession clerk was dancing. I’ve been to countless Cardinals baseball games in my life, this was an exciting moment, concession workers celebrating with fans. I’ve seen it before, but not quite like this…… What makes it even more special, Matt Holliday loves being a Cardinal, he loves the fans, and we love him. He wore the Cardinal’s uniform as well as anyone ever has. What a classy gentleman. Thank you Matt!